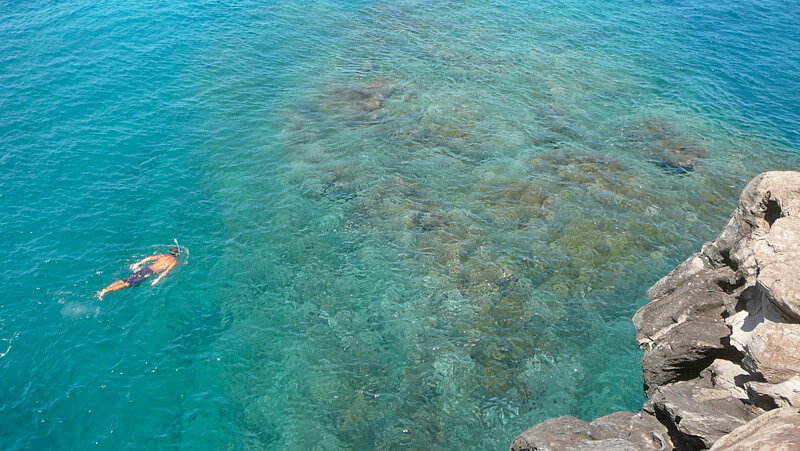 When you’re visiting Maui, snorkeling is a special treat that you will not want to miss. There are many great spots for snorkeling in Maui, and we hope you’ll take advantage of several of them! Online maps are available from Boss Frog dive shops and from Maui Information Guide. Of course, we think that Honokeana Cove snorkeling is positively the best. The guests at Honokeana Cove condos have access to some of the best snorkeling in Hawaii, in a peaceful and private cove. If you’re already experienced at snorkeling, you’ll find Honokeana Cove to be a special treat. Not only does it have coral formations and colorful fish: it also has a large resident population of Green Sea Turtles that are fascinating to observe while you are snorkeling. You probably already know that the turtles are a protected species, so you should not bother them, or swim close enough to a turtle to touch it. – Snorkel versus scuba, plus ways to snorkel without putting your face in the water, or even without getting wet! 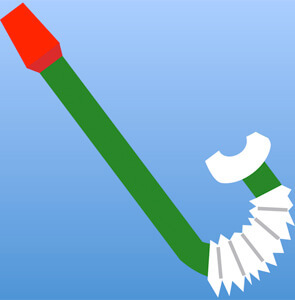 – Choosing the snorkel equipment that’s perfect for you. – Snorkel basics – what to wear, water safety, breathing and vision. – Snorkel skills – choosing a snorkeling site, and how to enter and exit the water. At Honokeana Cove Unit 114, we have a chest full of snorkel equipment on the lanai that is free for your use. You may find additional gear in the bedroom closet – things tend to move around! You will want a face mask, a snorkel and a pair of swim fins. If you don’t find exactly what you want, we suggest that you walk five minutes to Water Works Sports (in the lobby of Napili Shores condos) or just past them to Snorkel Bob’s (at 5425 Lower Honokapiilani Road) and rent a set for the duration of your stay. 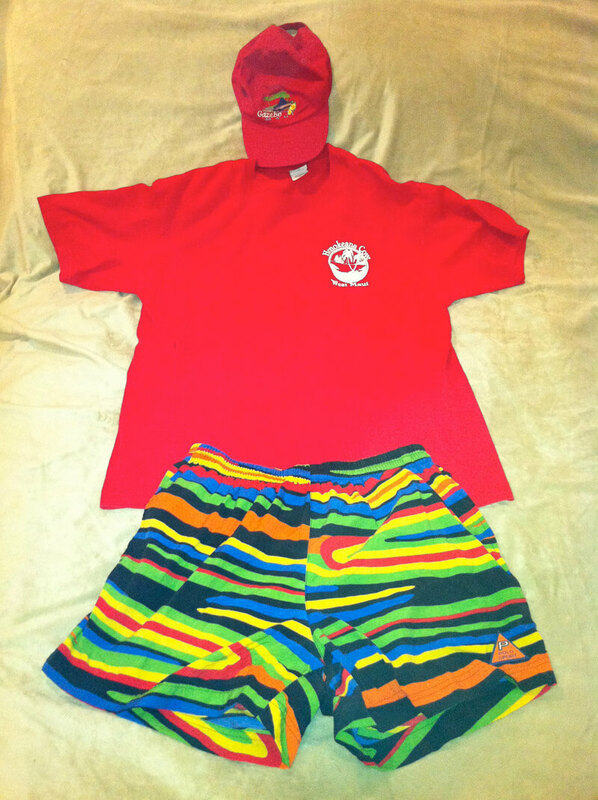 You can also visit Boss Frog’s Dive, Surf & Cycle, 0.3 miles to the south in Napili Plaza, 5095 Napilihau St, Lahaina. Rentals are not very expensive, and the shop can help fit you with just what you need. If you usually wear glasses or contact lenses, you can buy or rent a mask with optical correction. Masks are available with correction between minus 1.5 and minus 7 diopters. If you’re not sure how to choose the best equipment for your purpose, please read Art’s blog on Snorkel Equipment for a complete guide. In the chest you’ll find anti-fog drops: Sea Drops or Snorkel Bob’s Anti-Fog Goop. A few drops swished inside your face mask, then rinsed off in sea water, will help keep your mask clear. For more about mask and snorkel clearing, see Art’s blog Snorkel Basics. If you want extra buoyancy in the water, you’ll find “swim noodles” (long cylinders of soft foam) on the Unit 114 lanai or in the bedroom closet. If you hold one or two of these across your midsection as you lie down in the water, you’ll float more easily. Unit 114 also has a child’s water flotation vest, usually stored in the bedroom closet, if you want extra security for a young person. You may also want to have an underwater camera. Inexpensive underwater cameras are available at snorkel and dive shops, and at most supermarkets, such as nearby Napili Market (5095 Napilihau St). Our guests have taken really nice water photos of fish and sea turtles, often with inexpensive cameras. The best days for photography are also the best days for snorkeling: when the water is clear and calm, and the sun is unobstructed by clouds. Honokeana Cove is shallow and usually very calm. Because of this, the sun warms the water, and most guests find that they don’t need a wet suit or a dive skin to stay warm when in the Cove. However, time will zip by when you are snorkeling, and you will have steady sun on your back side and your head for a surprisingly long time. Therefore, you need a water-resistant sunblock lotion (SPF30 or more). 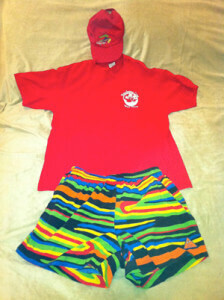 You might also want to wear a shirt and a dunkable hat for extra protection. Just remember to use the fresh water shower next to the pool to rinse all your snorkeling clothes when you come out; otherwise, the salt water may break down the fibers of your shirt. No matter how you choose to dress, if you begin to get chilly, don’t take chances, but come out of the water and warm up. Take a quick rinse under the shower to get the salt water off, and then plunge right into the heated Cove swimming pool to make your body happy again. Before you go snorkeling, stand at the edge of the lawn and look for large patches of sand close to the shore. It’s easiest to get into the water by walking on sand, since the sand gives you good solid footing. Sand shifts around with the seasons and the weather. Typically, sand moves away from shore during winter storms that stir up strong wave action, then returns on days when the waves are calmer, and during the summer. One way to enter the Cove is to come down the steps from the lawn and turn left, taking the walkway next to the seawall. At the end of that walkway there are several steps that lead down into the water. There’s often a sandy area near those steps, making it easy to get into the water. – (1) Put on your mask and fins while you’re sitting on the steps; then wait until a wave comes in, making the water a foot or two deep. At that time, make a shallow dive straight out from the steps. The idea is to float flat on the water, swimming with feet and hands until you are away from the shore where the water is calmer but still not very deep. At that point you can find a sandy space to stand up and get your bearings, or simply swim out and begin snorkeling. – (2) Choose another part of the rocky beach where the sandy bottom is closer to the shore. Some guests ignore the walkway. They simply come down the steps from the lawn and head for a place where the sand is close to the shore. Then they walk straight across the rocks into the water. This works best if you have tough feet and good balance; better yet, brace yourself against a buddy, since four feet are more stable than two. Be careful when you get to the rocks near the water, since rocks that get wet are often slippery with algae. If the wet rocks are too slippery for your feet, when you get to them just sit down on the rocks and “scootch” on your bottom the last few feet to the water. 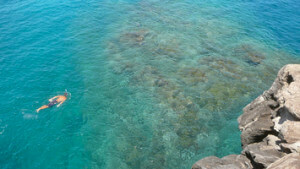 For more tips on entering the water, see the third installment of Art’s snorkeling article HERE. – (1) Tevas. One good approach is to wear strap-on waterproof sandals, sometimes called reef shoes. You want something that fastens securely to your foot, such as the kind of water sandals that have a heel strap or an enclosed heel. Teva and other companies make this type of footwear. Flip-flop (thong) sandals are not advised; they slip off too easily and will not give you a secure footing. When you get to the water, you can sit down on the pathway or on a large rock, place your sandals on a rock an arms length away from the water, and put on your fins. – (2) Booties. Another possibility is to wear dive booties such as scuba divers use. The booties have rubber soles, so you can walk in them, and then you can pull on your fins with the booties still on your feet. Booties and fins that fit over them can be rented from dive shops. – (3) Not Fins. We don’t recommend walking down to the water wearing swim fins. Fins are streamlined to glide through the water and their bottoms are too smooth to provide good traction. When to Put on the Fins? 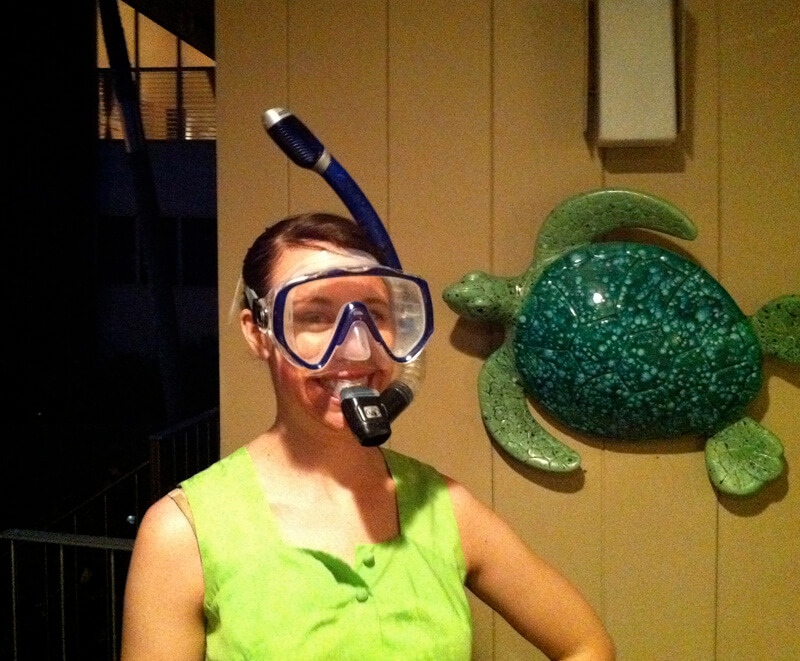 Different people have different ideas about the best time to put on their snorkeling fins. – (1) Right Away. As mentioned above, the bottoms of swim fins are smooth, so they are too slippery to wear when you are walking across the rocks to the water. However, once you reach the wet rocks near the shore, you can sit down and don your fins right away. Just toss your sandals up away from the water, so they don’t float out to sea while you’re snorkeling. Then you can scootch on your bottom across the few wet rocks to the water, and as soon as you hit water, spread out and float yourself away from the shore. If you prefer, you can walk along the sandy bottom to some deeper water – however, if you already have your fins on, you’ll find it a lot easier to walk if you turn around and walk backward rather than forward! – (3) In Hip-Deep Water. If you delay putting on your fins until you are a dozen feet away from the shore, you’re less likely to get sand trapped inside them. However, you may have to float yourself while you put on the fins, which some folks find awkward. Each person finds their own best way to get from land into water with their snorkeling gear. Do you really need to cover your feet when you snorkel? Yes, absolutely! Whether you wear swim fins or just strap-on sandals, you should definitely have something beneath the soles of your feet any time you are snorkeling. Think about this: if an unexpected wave catches you off balance, you will instinctively extend your legs to put your feet on firm footing. If this happens, you are in danger of cutting your foot on a sharp piece of coral. Even worse, if you step on a sea urchin (those spiny pincushions you see, often tucked inside cavities in the coral), you may get a lot of painful spines in your foot, and that would definitely put a crimp in your vacation! We suggest, play it safe and wear foot protection. Also, coral is easily damaged and it takes a very long time to grow back, so please try never to step on it. What about your hands? You should not be touching any sea life, whether it be fish, turtles or coral. Your hands are for paddling and balance, and they don’t need protection. If the waves and surge are so strong that you might be tempted to grab a rock for stability, please don’t go into the Cove. It would not be safe, and the visibility would be so poor that you wouldn’t be able to see much anyway. – (1) Choose good weather for swimming and snorkeling. That means a calm Cove (no big waves rolling in), no strong wind or rain, and preferably sunshine. Hint: if you see a large number of surfers in the water beyond the mouth of Honokeana Cove, expecting and hoping for big waves, it’s probably not a good day to be paddling around in the Cove. The water will be clearest if it has not rained heavily for the previous couple of days, because strong rain washes mud from the hills and that makes the water cloudy. – (2) If you want to plan for smooth snorkeling, choose a day when you can snorkel in early morning or late afternoon, at a time close to low tide, on a day with not-too-big surfing waves. You can find high and low tide times and amplitudes at Tide Forecast. You can find detailed surf wave forecasts for Little Makaha (the surfing area just outside the south edge of Honokeana Cove) at Magic Seaweed. – (4) If you feel sick, give yourself the day off. There are plenty of land-side adventures to take until you feel at the top of your form. – (5) If you are tired or chilly, get out of the water. Use the shower to rinse off the salt water, then hop into the heated swimming pool. That will put you back into your comfort zone quickly. Then, come back to your condo and take a hot shower. Near a sandy beach, the water tends to be cloudy, which means less coral and fewer fish. Honokeana Cove has a rocky beach which helps keep the water clear, but there is still some sand near the shore. So here’s the deal: for the best snorkeling, you want to swim into the Cove. Until you get familiar with Honokeana Cove, we suggest that you swim toward the right side (the north side) of the Cove, in water where the coral is 6 or 8 feet beneath you. We recommend the right side because there are fewer waves and less tidal surge, making it easier for you to maneuver and improving your visibility. When you swim in 6 to 8 feet of depth, the coral and the fish are close enough that you can see them well, but far enough away that you are unlikely to scratch yourself on the coral, either while you are swimming or if a wave knocks you off balance. By the time you are one-third of the distance between the rocky beach and the mouth of Honokeana Cove, the water will be pretty clear. You should periodically pop your face up and see where you are – otherwise, the current may push you off your intended path, or drift you too close to the shore. You’ll see a variety of tropical fish, and if you try to remember what they look like, when you get back to Unit 114 you can use the “fish cards” and fish identification books to learn more about the creatures you saw. You don’t have to move all the time. Some of the most rewarding snorkeling comes when you hover above a fixed area, paddling only as much as needed to stay buoyant. You can watch the interesting behavior of the different types of fish as they chase each other, cuddle up close, feed and hide beneath the ledges and in the cavities in the coral. In the flat areas of the coral gardens at Honokeana Cove you will sometimes see a large number of fish nibbling at the algae. The longer you watch, the more fish you will see, because not all the fish are bright colored: many of them are tinted to blend into the coral. You will see occasional schools, mostly of a single kind of fish, but sometimes with a completely different fish riding along! You will see tiny fish as well as some a couple of feet long. You may even see an eel or sea snake, especially near the shore – however, don’t worry, it won’t bother you. They are very small, less than an inch in diameter and a couple of feet long, so they are really scared of anything as large as a person. As soon as it spots you, it will hide. One of the great rewards of snorkeling in Honokeana Cove is our large permanent population of giant Green Sea Turtles, or as the Hawaiians say, honu. It’s fun to see how many you can spot on any given day. The number varies all the way from a handful on up. Although the Cove is their primary home, their numbers seem to vary. Sometimes they hide under shelves of coral, and sometimes they may have decided to “dine out,” away from Honokeana Cove. They might also be visiting their cousins at the Mo’omomi Turtle Preserve on northwest Moloka’i; you can see Moloka’i just across the Pailolo Channel. 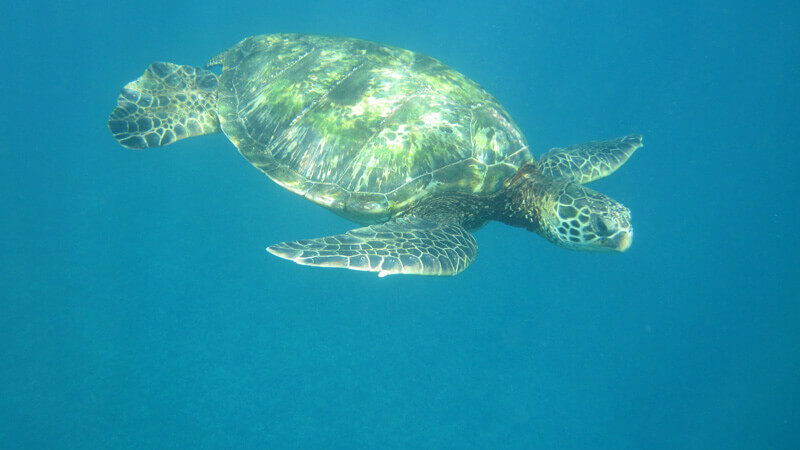 During the day you will see turtles resting on the bottom, between the coral formations. Often they slide themselves under a coral shelf, so that nothing is visible except perhaps a flipper. In fact, many of the shelves are deep enough to conceal a full-grown turtle. You’ll find more turtles on the right-hand (north) side of the Cove, but you will also find rugged individualists on the left-hand (south) side, and even resting on open sand in the center. Turtles can stay underwater for a long time when they are resting, but periodically each one will swim up to the surface to take a few breaths before returning to his nap. You will often see a turtle hovering in the water a couple of feet above this coral head. If you look closely you may see several small fish such as damselfish and angelfish grazing, eating the algae off the turtle’s back. Just as divers find “cleaning stations” where large fish invite smaller fish to clean off their parasites, the Green Sea Turtles have a cleaning station in Honokeana Cove, where they can have their algae groomed. Their shells need cleaning because if the turtles have too much algae on their backs, it slows them down and requires them to exert more effort. Note added 2016: Several turtles have learned that they don’t need to visit the cleaning station to get their shells groomed. The last two times I snorkeled I saw two turtles floating or slowly swimming several feet above the coral, as little fish nibbled at their shells. One of the turtles was a dozen feet distant from and below the large coral head; the other was a good hundred feet away. So far I have only seen this behavior on the north side of the Cove, where the water is calmest. As you know, sea turtles are officially a protected species, so don’t get too close or chase them. And certainly, no touching! Sometimes a turtle will swim up right beneath you – they don’t seem to look up when they are surfacing – but do your best to stay out of its way. You’ll be rewarded with a great close-up look at one of nature’s majestic creatures. For more about the turtles, see our Feature Story on the Green Sea Turtles. We suggest that you don’t swim beyond the mouth of the Cove. Honokeana Cove is relatively calm and protected from waves, but the open ocean is less so. After you explore the right-hand (north) side of the Cove, you may want to swim across the Cove to the south and return along the left-hand (south) side. As you cross Honokeana Cove, look beneath you at the sandy area. You may see a large school of goatfish, just hanging around. You may also see some larger fish, and perhaps a stingray cruising along the bottom. When you get to the south side of Honokeana Cove, you will be gliding above a rich coral garden. Be careful not to swim too close to the shallow coral areas. The waves are stronger on the south side and you don’t want a surge to wash you into the coral. As you return toward the rocky beach and the water gets shallow, you will see isolated coral heads spaced by areas of sand. This is a good time to watch for sea snakes or eels popping their heads out of the coral, or scuttling from one rock to another to get out of your way.